Are you a wine lover? If you are, then you must be aware of the fact that the varieties of grapes used in the winemaking process heavily influence its flavor and texture. You must also know that Italian wines are famous for their historical background, taste and finesse. Different kinds of grapes are used to make wines all around the world with some being more popular than the others. Let’s have a look at some of the best grape varieties used for winemaking. Sangiovese grapes are black in color. They are grown widely in the Central parts of Italy. They are normally used as a chief component of Vino Nobile di Montepulciano and Chianti . It is also the only permitted grape for the famous Brunello di Montalcino. This grape variety is high yielding. It ripens late and is known to perform well on calcareous soils that are drained well. These soils are normally found on the hillsides that face the south. For a really long time, it was afflicted by unfortunate clonal assortment and immense over cropping. Nevertheless, since the early 1980s the quality and superiority of Sangiovese wines has sky rocketed and today these wines are counted as one of the most sought wines on the globe. Wines produced with the Sangiovese grapes pronounce acidity and tannins, even though they don’t always have a rich and deep color. Their character can diverge from having an essence of plums and red cherries to having leather and farmyard nuances. Merlot grapes are also very famous for winemaking. Wines made of merlot grapes are usually light and soft. They are normally considered a great choice for those who have just started drinking red wines. Merlot wine can be paired with almost any meal. IF you want to make a safe choice, go for it! It won’t disappoint you. Merlot grapes are considered the chief player in the famous Bordeaux blend. 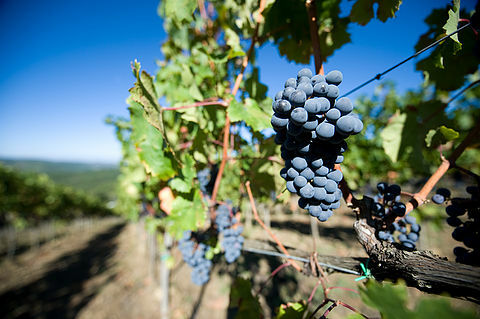 Along with Australia, merlot grapes are also grown on the west coast of the United States. The taste is slightly inclined towards black cherry and herbal flavors in the varietal kind. The texture is normally round with a middle palate gap being common. Chardonnay was not only the most popular white grape throughout the 90s, but it is still very popular for making wines whether they are still or sparkling. Normally, wines made using chardonnay grapes are paired with fish or chicken dishes. The chardonnay grapes are generally grown in viticultural areas in a variety of climates. Classic taste in varietal chardonnay wines is more on the velvety side. Order and enjoy our Chianti Classico, Chianti Classico Riserva, Torre Di Montemaggio, Quinta Essentia Di MonteMaggio IGT, Chardonnay di Montemaggio IGT or Rose Di Montemaggio. We assure you that they are all made of the best quality Sangiovese, Merlot and Chardonnay grapes that we grow with special care in our vineyards.